Data centers are equipped with a wide range of security, power management, cooling and network access equipment. Biometric sensors, security cameras and secure access are the first items encountered on-site. In addition to thousands of servers, power regulation systems, diesel generators and air conditioning systems are vital aspects of the facilities. All these infrastructures are totally controlled and managed by contracted IDC housed hosting infrastructure experts. Connectivity to the Internet is assured by multiple black fibers through diverse entry points. Multi-gigabit connectivity is used to link data centers to each other. A team of experts monitors the data center and network operations 24 hours a day, 7 days a week, 365 days per year. Global Data Center Datasheet : NTT America's Global Footprint will help extend your reach around the world. 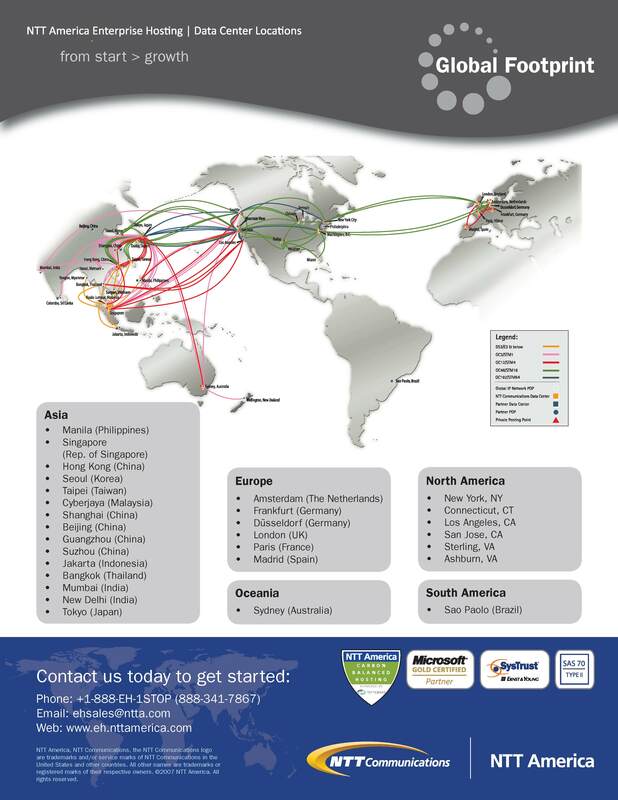 The Global Footprint datasheet includes data center locations and details on the NTT global networks. Noida: 39, Duplex, Sector-82, Noida - 201304.